so, did you guys have fun stalking bridget's blog yesterday? don't be bashful. i know you were. i hope you read the love story in it's entirety and i hope that it made you weak in the knees. i know you were dying over her wedding pictures. isn't she stunning? i am loving this love story series already. cannot wait to share more. here is a little valentine's day DIY for you. here was my inspiration. isn't it lovely? i would so have done that but i don't own a sewing machine. if i was on twitter i would type #whatiswrongwithme? after i don't own a sewing machine. what is that "#" for anyway? i am a little all over the place but i am currently exploring all that is twitter. i think what i love the best about twitter is it's accessibility. i can totally put an @ symbol in front of anyone's name and write to them. i can tweet blogging/creative superstars like ruthanne. we tweeted, twitted?, the other night. is that what you call it? anyway, you can tweet anyone! they may not reply but they will read it, right? it's sort of like the days when i hand wrote letters to JTT jonathan taylor thomas, except then i never heard back. #brokenheartedmiddleschooler. 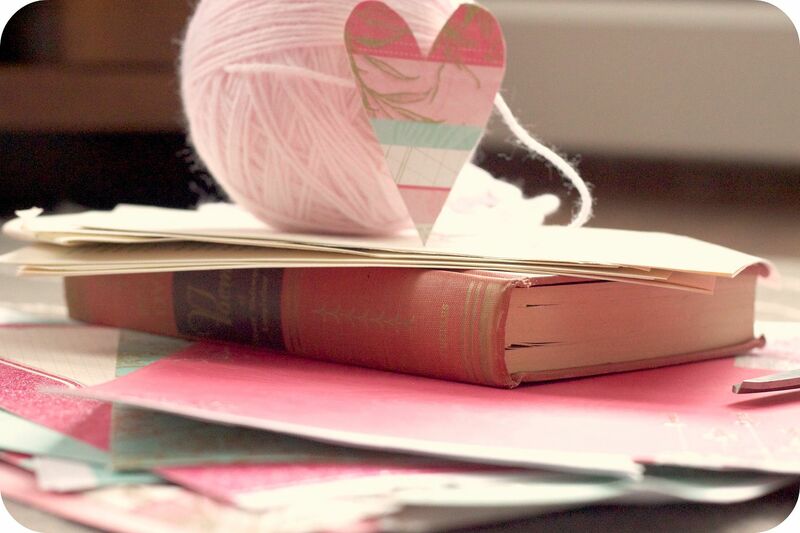 supplies: pretty scrapbook paper, book pages, yarn, hole punch, scissors and glue. step 1: cut out a heart and user it as a tracer to make lots'o hearts. step 2: i glued my hearts onto book pages and then cut them out, so they would have pretty backs. i think book pages are pretty. if you have double sided paper you would, obviously, not need to do this. i hung the garland on our cabinets just to take pictures, i will really be hanging it from the ceiling in between our living room and kitchen, so we will see both sides. step 3: cut out triangles from book pages for the bunting part. 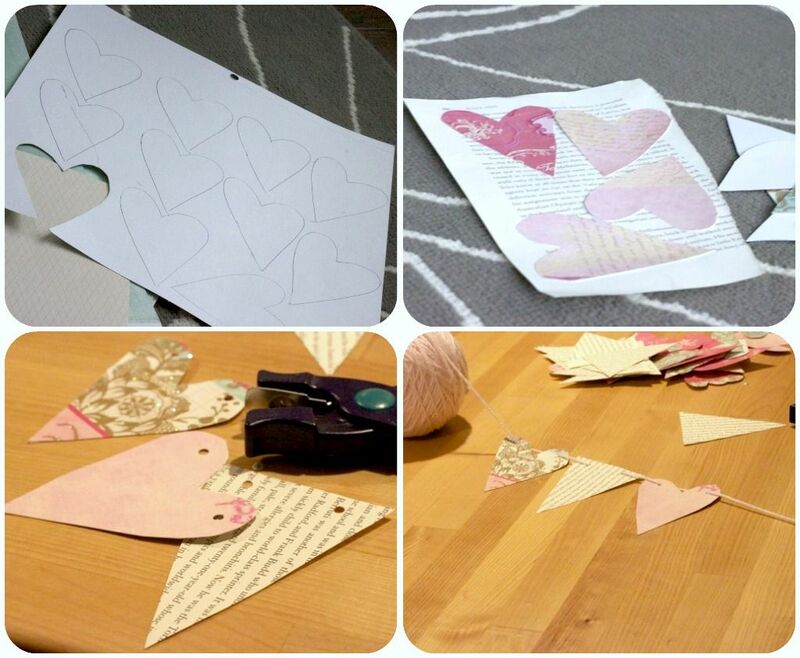 step 4: hole punch two holes into each triangle and heart. step 5: string your soft pink yarn through all your dainty pieces. you can only use soft pink yarn when making this, you know. step 5: hang it up and think lovely thoughts about your valentine. 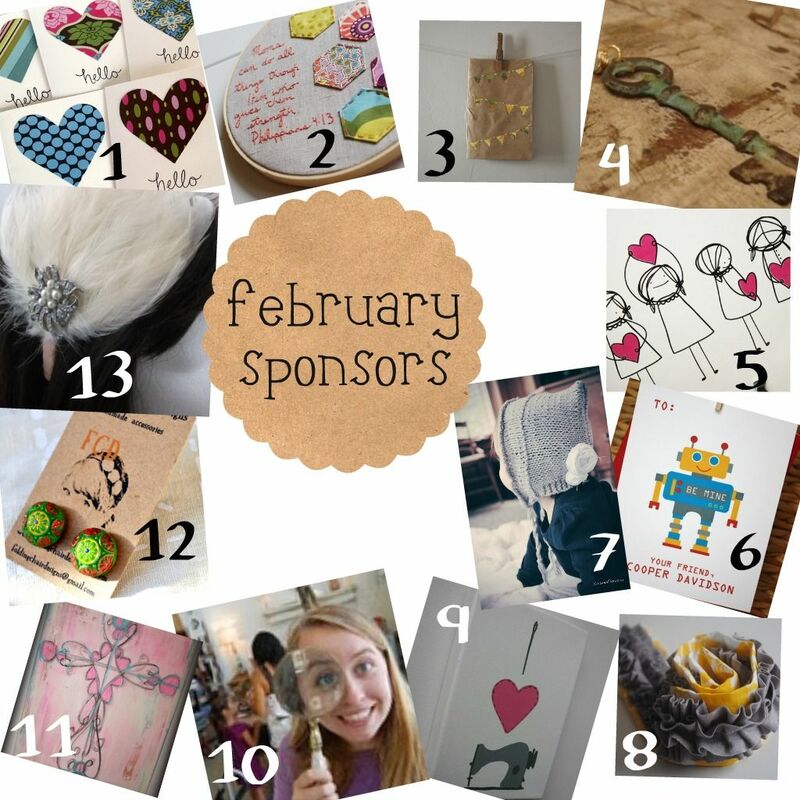 and last but certainly not least, in my post that has turned into much more than a DIY, let me introduce you to my sweet sponsors for the month of february! they are pretty fabulous if i do say so myself. take some time and check them out, you will leave feeling inspired and maybe with a few treats for yourself or gifts for your loved ones, eh? yes, i love bridget. and i had already looked over her wedding photos but just looked at them again. so pretty. i do not have a sewing machine either. I am starting to set aside tax money...eek. And I am sooooo not a supa star. Love your sponsors! I follow "the love of joy" and love her stuff! Thanks for introducing new faves! That is adorable. I also may have written to Jonathan Taylor Thomas. Just sayin. Looking forward to following Take Heart! New nickname. If k.sue gets to call you something then I get to call you something. In Other news, I don't even know how to understand twitter let alone those symbols. I barely know how to work facebook. #welcome me to the 21st cench. And I too wrote to JTT and never heard back. And Devon Sawa. Scott Wolf. Sad face. Yes, I totally blog stalked her. I can't stop thinking about that story! She should put it into book format. Like The Pioneer Woman. I will admit that I totally stalked her blog almost all day yesterday! She is stunning and her love story is incredible! Thanks for these Danielle!! question from the kansas girl: how do you get sponsors? what do you charge for advertising? maybe you can just email me? with love from kansas. i love your blog. did you see my wreath? oh that's soooo frigging cute. i need to get int he spirit and do something like that. the snow is making me lazy. and thanks for the second shout out!! p.s. I will heart JTT FOREVER!!! thank you for the sweet comment on my blog! and bridgets love story will never get old..love her. i did not have a jtt poster hanging over my bed when i was in 4th grade. just sayin'. i am loving all of your diy craftiness chick! and i adore--for the love of joy! if you people (danielle and kyle!) were ten yrs older like i am you would have kissed the screen watching silver spoons with ricky schroder too. just like all the normal 4th grade red heads. Ah, I love the valentine garland! Beautiful. oh my gosh. got home from a brunch this morn and guess what was hanging on the wall. scotty copied this diy from your blog and went to an antique store downtown, got an old book, and made this for me! crazy boy.